From one of his frequent trips to Germany, a friend of ours brought back a mixed case of German wines that my friend ManSoo had put together for us. 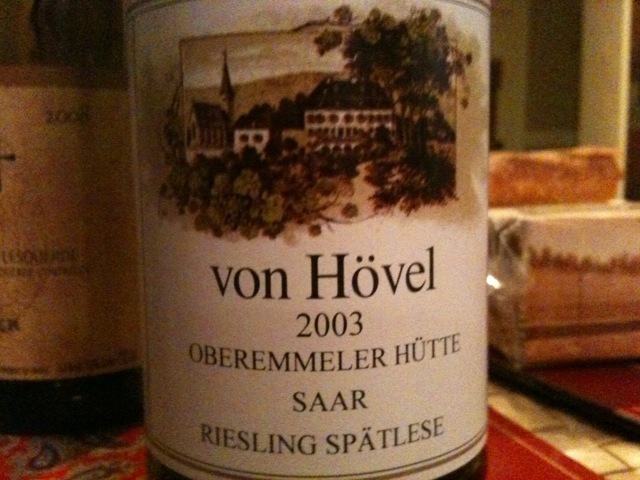 It contained some Kurt Hain wines, a sparkler, some 1989 Auslese and three wines by von Hövel, a VDP winery at the river Saar, one of them this 2003 von Hövel Oberemmeler Hütte Riesling Spätlese. Now, for those not familiar with the Mosel region, the Mosel has two tributary rivers, the Saar and the Ruwer that are part of that wine growing area. The Saar, as I have explained before, meets the Mosel just south of Trier, in the town of Konz. It commences in France and then flows into Germany. It is a mere 246 km (152 miles) long, but only its final stretch in the state of Rhineland-Palatinate is used for growing wine, mostly Riesling. It is known to produce more mineralic, somewhat tarter Rieslings than the middle Mosel. The microclimate is cooler than at the Mosel, so the grapes tend to ripen later and can reach acidity levels without the higher sugar levels you can find on the Mosel, which gives them a distinct character. Most of the vineyards used to belong to the Catholic church, but in the course of secularization in the 19th century, many private investors bought plots and began wine making. Rich families began to settle later in the 19th century which led to the term “Saarbarone” (baronets of the Saar, a term derived from “Ruhrbarone” which was used for the industrialists in the Ruhr area that made a fortune when the industrial revolution took off). A lot of the estates on the Saar are very grandiose, unlike most Mosel estates. Weingut von Hövel has been owned by the von Hövel family since 1803 (just in time for secularization) and is one such rather big mansion. It is a member of the prestigious German association of quality winemakers, VDP, and owns 11 hectares (27 acres) in the Saar valley which are planted with Riesling only. Its annual production is around 60,000 bottles. Since 2010 Max von Kunow has been the owner of the estate. Besides holdings in the legendary Scharzhofberg, the winery exclusively owns the vineyards Kanzember Hörecker and Oberemmeler Hütte, the vineyard this wine was from. Oberemmeler Hütte is a South-west facing tiny plot of land. Unlike most vineyards in the area, it is quite far removed from the river, on a higher lying plateau. In the 1868 Prussian taxation map, which marked vineyards according to their property value and therefore -indirectly- quality, Oberemmeler Hütte is in the same category as the Scharzhofberg, i.e. very highly ranked. I was excited to try this wine, because while we lived in Trier, we were only about a 7 minutes drive away from where the Saar meets the Mosel and Oberemmel is pretty close to where that happens. We actually had our wedding celebration in a BBQ hut only a couple of miles away from this particular vineyard. So this is as neighborhood as it gets for Saar wines for us. The wine poured in a very clear pale, almost white color. Absolutely no ageing was noticeable when looking at it. The nose was delicate, with fresh aromas of citrus, white peach, cream and hints of vanilla. There were some traces of age in the nose, but not prominent at all. On the palate, the wine was light bodied and surprisingly thin in texture. It had a somewhat ethereal feel to it in its lightness in general. The taste was still clean and fresh. There were no citrus aromas, but apple and pear had come in. There was hardly any minerality noticeable which was a bit surprising. The finish was medium long. The wine was very interesting to me, because it was a combination of still quite fresh, but also seemingly contracted from age, which were the two poles that this wine was tied to. At times, I wanted it to be a bit firmer, and at other times I enjoyed its lightness. It was a type of aged Riesling I don’t think I have experienced in the past. Good to very good, I would say. Check out the vineyard’s location here. Agree with @wineking3 that I sometimes am put off by the sweetness of Spatlese but good to know that older ones can moderate a bit. Great information and done with passion as already mentioned. Thanks. Thank you so much! And yes, try older vintages. They are so worth it. Interesting. What do you think accounts for the freshness on the palate? I wish I could tell you, Josh. That is probably for the much more expert wine drinkers than me to tell. There was just a delicate freshness about this, as in clear, as in cooling, as in refreshing. I wish I knew what made a wine be like that. Sounds wonderful. Very surprising for a wine that old to taste so fresh. If only so many nice wines were available in my small town in the UK! I’m going to have to start exploring more online, just the shipping that gets you isn’t it? Great post! I love reading about the wines you are so familiar with because you have either visited or live in the regions where these wine originated. You write with such passion about them. Thanks for sharing! Cheers! Thank you so much, Jean. This is one of the nicest compliments I received on this page. And it is great to know that my enthusiasm shows in my writing, because I really, really do care a lot about these wines. Nice review Oliver. Spatlese Riesling is great but sometimes it’s a little bit too sweet for my palate. @frankkwine1982 I think Oberemeler Hutte is the appellation (I think called lage in German). Riesling is the grape variety. Hi Charlie, and thanks for the full link. If I click the link I provided it takes me exactly there. Did that not happen for you? Nice post! A great window into this corner of Mosel. What would you consider to be some of your best value Mosel/Saar Rieslings, available in North America? Thank you for your kind words, Darryl! For best value, you want to look into the “second” tier wineries. To me, some of the best value available are Dr. Hermann and Karl Erbes wines, both from the Middle Mosel. Dr. Hermann is easier to find in the US, I begin seeing it at wine stores more and more often. The best value is probably Reuscher-Haart from Piesport, who also export to the US. 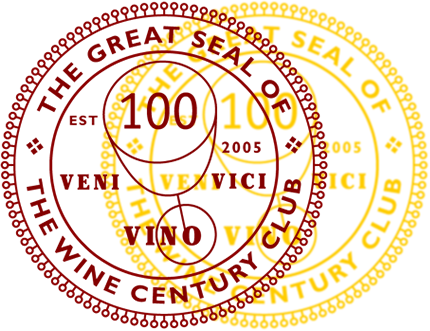 You can check out these wineries’ profiles in my Winery Visit section. Dr. Loosen makes pretty good wines that are still affordable, too. From the Saar it is a bit more difficult because there are so much fewer wineries. Peter Lauer is the up and coming superstar, but his wine prices have gone up significantly lately and his becoming a VDP member probably cemented that. Of the big estates, Kesselstatt wines are usually still somewhat affordable, but I heard that Vereinigte Hospitien are also moving more into export. Their prices should be good when they reach the US.